Drew Emeric Stanton (born May 7, 1984) is an American football quarterback for the Cleveland Browns of the National Football League (NFL). He was drafted by the Detroit Lions in the second round of the 2007 NFL Draft. He played college football at Michigan State. Stanton has also been a member of the New York Jets, Indianapolis Colts and Arizona Cardinals. Stanton grew up in Okemos, Michigan, a large suburb of Lansing which borders the campus of Michigan State. His family moved to Lake Oswego, Oregon, where he played peewee-football and continued to play until his sophomore year at Lake Oswego High School. Eventually, the Stanton family moved to Farmington Hills, Michigan, where he graduated from Harrison High School. Stanton was ranked as a four-star prospect coming out of high school by Rivals.com, and was also ranked the #6 Pro-Style Quarterback in the country. Stanton redshirted through Michigan State's 2002 campaign before serving as the #2 quarterback behind Jeff Smoker in 2003. In 2003, he also played on special teams where he made several impressive open field tackles. On November 15, against Wisconsin, he scored his first collegiate touchdown, a 13-yard rush. However, Stanton injured his knee in the Alamo Bowl against Nebraska while covering a punt and had to undergo reconstructive surgery. After becoming the starter in 2004, Stanton received regional and national praise for his play on the field and was also named an Academic All-American. On September 25, against Indiana, he threw for 172 yards and two interceptions but rushed for 134 yards and two touchdowns. On October 9, against Illinois, he recorded his first collegiate receiving touchdown on an 18-yard reception. On October 16, against Minnesota, he threw for 308 passing yards, three passing touchdowns, and two interceptions. In the 2004 season, he finished with 1,601 passing yards, eight touchdowns, and six interceptions. Stanton continued his role of starting quarterback in the 2005 season. On September 17, against Notre Dame, he had 327 passing yards, three passing touchdowns, one interception, 48 rushing yards, and one rushing touchdown. In the next game, against Illinois, he had 259 passing yards and five touchdowns. Overall, in the 2005 season, he finished with 3,077 passing yards, 22 passing touchdowns, 12 interceptions, 338 rushing yards, and four rushing touchdowns. In 2006, Stanton led the Spartans to the largest point margin comeback in NCAA Division I-A history. Against conference foe Northwestern, he accounted for 331 total yards and three touchdowns, coming back from a 35-point third quarter deficit. He began his prime time performance with an 18-yard touchdown pass, and he later ran for a 12-yard score. In the fourth quarter, Stanton completed six straight passes before capping the game-tying march with a 9-yard strike with 3:43 remaining. He eventually directed the drive that resulted in a game-winning field goal to complete a 41–38 victory. For his career at Michigan State, Stanton completed 64% of his passes throwing for 6,524 yards, with 42 touchdowns and 28 interceptions while also rushing for another 1,512 yards and 15 touchdowns. Stanton participated as a quarterback in the 2007 Senior Bowl, where he helped lead the North to victory. He was named the Offensive MVP for the North. Stanton was selected by the Detroit Lions in the second round with the 43rd overall pick in the 2007 NFL Draft. He was placed on season-ending injured reserve during training camp on August 3, 2007 after having knee surgery. In 2008, Stanton sprained his thumb on his throwing arm during preseason, keeping him out the remainder of the preseason. After Jon Kitna was placed on injured reserve, he moved up to second string quarterback, behind Dan Orlovsky. Stanton made his NFL debut in a game against the Jacksonville Jaguars (entering in relief of Daunte Culpepper, whom the Lions had signed only days earlier after Orlovsky suffered a thumb injury). He threw a one-yard touchdown on his first career passing attempt and finished the game having completed 6 of 8 pass attempts for 94 yards. 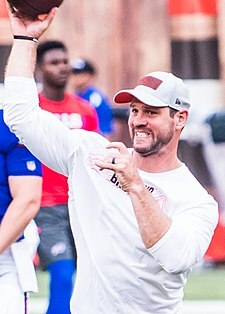 The 2009 season began with Stanton as third string quarterback behind 2009 NFL Draft first overall choice Matthew Stafford and previous starter Culpepper. With Stafford injured for the Week 6 game against the Green Bay Packers, he relieved Culpepper who was also injured during the game. He threw two interceptions in a 0–26 loss for the Lions. Stanton appeared again in relief of Culpepper in Week 15 against the Arizona Cardinals. He was 10/19 passing with one interception, however he scored on a one-yard rushing touchdown on a draw play – with Arizona winning 24–31. Stanton made his first career start Week 16 against the San Francisco 49ers. In the 20–6 loss, he finished with 130 passing yards and three interceptions. During the 2010 season, Stanton saw action again as Matthew Stafford and Shaun Hill went down with injuries. He came in as relief for Hill against the New York Giants and went 19/34 passing for 222 yards, with a touchdown and an interception. He made his second career start against the Bears in Week 13 and went 16/24 passing for 178 yards and one touchdown. He started the next game against the Green Bay Packers and led the Detroit Lions to a victory with a 13-yard touchdown pass to Will Heller. Drew also helped the Lions achieve their first road win in over three years, leading them to a 23–20 victory over the Tampa Bay Buccaneers. Stanton was signed by the New York Jets on March 16, 2012. After the Jets acquired Tim Tebow from the Denver Broncos on March 21,he requested a release or trade. On March 23, 2012, the Jets traded Stanton to the Indianapolis Colts and a seventh round pick in the 2012 draft for a sixth round pick in the 2012 NFL Draft. The Indianapolis Colts chose first overall draft pick Andrew Luck over him for the starting position. On March 13, 2013, Stanton signed a three-year, $8.2 million contract with the Arizona Cardinals. He served as backup quarterback to Carson Palmer whom the Cardinals acquired from the Oakland Raiders on April 2, 2013. After Palmer's shoulder injury in Week 1 of 2014, Stanton became the starter for Week 2 against the New York Giants, making his first start since 2010. On October 5, 2014, he sustained a concussion on a hit from Denver Broncos linebacker Von Miller. After Carson Palmer suffered a season-ending injury in Week 10, Stanton stepped in and led the Cardinals to their 8th and 9th wins of the season. In December, he suffered an MCL sprain and then subsequent infection, missing the rest of the season. In the 2015 Week 17 matchup against the Seattle Seahawks, Drew Stanton was brought in for the 2nd half of the game after Head Coach Bruce Arians pulled Palmer due to the Cardinals already having locked up the division and 2nd seed in the NFC. On March 8, 2016, Stanton signed a two-year deal with the Cardinals worth $6.5 million with 4.5 million guaranteed that goes to 2018. Stanton primarily served as Palmer's backup again in 2016. He came in relief of Palmer after he suffered a concussion in Week 4 against the Rams, completing 4 of 11 passes for 37 yards and two interceptions in a 13-17 loss. He made his only start of the season the following week completing 11 of 28 passes for 124 yards and two touchdowns in a 33-21 win over the 49ers. In Week 7 of the 2017 season, Palmer suffered a broken arm during the game against the Los Angeles Rams, making Stanton the new starter. He then started the team's next two games. He did not start the team's Week 11 game due to a sprained right knee. However, he was still active as the backup to Blaine Gabbert. On December 18, 2017, Stanton was renamed the starter for Week 16 after struggles from Gabbert. Stanton started the final two games of the regular season and helped lead the team to victories over the New York Giants and Seattle Seahawks. On March 25, 2018, Stanton signed a two-year contract with the Cleveland Browns. Stanton is the son of Gaylord and Christine Stanton. He is committed to charity work and created the High 5ive Foundation in support of the Special Olympics and the Children's Miracle Network, his two favorite charities, among others. The name came from the number (5) on his Lions jersey and he says his goal is to have five major fundraisers per year. "This is truly a passion for me, and I try to get involved in the community as much as possible," he says. He is a member of the national fraternity Sigma Alpha Epsilon at Michigan State University. His agent is Mike McCartney. He married Kristin Schrock on June 27, 2009. He graduated with a major in kinesiology. He is a Christian. Stanton is also well known throughout the NFL for his extravagant touchdown dances. ^ Eggers, Kerry. "Lake Oswego roots still mean a lot to Arizona Cardinals' Drew Stanton". Pamplin Media Group. Retrieved January 21, 2018. ^ Murphy, Austin (October 3, 2005). "A Spartan's Revenge". Sports Illustrated. Retrieved December 27, 2009. ^ "Drew Stanton Profile – Football Recruiting". Michiganstate.rivals.com. August 28, 2001. Retrieved October 19, 2010. ^ "Michigan State at Wisconsin Box Score, November 15, 2003". College Football at Sports-Reference.com. Retrieved January 21, 2018. ^ "Michigan State at Indiana Box Score, September 25, 2004". College Football at Sports-Reference.com. Retrieved January 21, 2018. ^ "Illinois at Michigan State Box Score, October 9, 2004". College Football at Sports-Reference.com. Retrieved January 21, 2018. ^ "Minnesota at Michigan State Box Score, October 16, 2004". College Football at Sports-Reference.com. Retrieved January 21, 2018. ^ "Drew Stanton 2004 Game Log". College Football at Sports-Reference.com. Retrieved January 21, 2018. ^ "Michigan State at Notre Dame Box Score, September 17, 2005". College Football at Sports-Reference.com. Retrieved January 21, 2018. ^ "Michigan State at Illinois Box Score, September 24, 2005". College Football at Sports-Reference.com. Retrieved January 21, 2018. ^ "Drew Stanton 2005 Game Log". College Football at Sports-Reference.com. Retrieved January 21, 2018. ^ "Michigan State at Northwestern Box Score, October 21, 2006". College Football at Sports-Reference.com. Retrieved January 21, 2018. ^ "Drew Stanton College Stats". College Football at Sports-Reference.com. Retrieved January 21, 2018. ^ "News". Buccaneers.com. Retrieved October 19, 2010. ^ Drew Stanton College Stats. SportsReference. Retrieved March 17, 2013. ^ "2007 NFL Draft Listing". Pro-Football-Reference.com. Retrieved January 21, 2018. ^ "Detroit Lions: Drew Stanton". Detroit Lions. Retrieved January 21, 2018. ^ "Jacksonville Jaguars at Detroit Lions - November 9th, 2008". Pro-Football-Reference.com. Retrieved January 21, 2018. ^ NFL.com (October 18, 2009). "NFL Game Center: Detroit @ Green Bay". Retrieved December 21, 2009. ^ NFL.com (December 20, 2009). "NFL Game Center: Arizona @ Detroit". ^ "Detroit Lions at San Francisco 49ers - December 27th, 2009". Pro-Football-Reference.com. Retrieved January 21, 2018. ^ "Detroit Lions at New York Giants - October 17th, 2010". Pro-Football-Reference.com. Retrieved January 21, 2018. ^ "Chicago Bears at Detroit Lions - December 5th, 2010". Pro-Football-Reference.com. Retrieved January 21, 2018. ^ "Green Bay Packers at Detroit Lions - December 12th, 2010". Pro-Football-Reference.com. Retrieved January 21, 2018. ^ "Detroit Lions at Tampa Bay Buccaneers - December 19th, 2010". Pro-Football-Reference.com. Retrieved January 21, 2018. ^ Cimini, Rich (March 23, 2012). "Jets QB Drew Stanton wants out". ESPN New York. Archived from the original on March 23, 2012. Retrieved March 23, 2012. ^ Drew Stanton Hopes to Win QB Job. ESPN. Retrieved March 14, 2013. ^ Katzowitz, Josh (September 14, 2014). "Carson Palmer (shoulder) out for Cards; Drew Stanton to start". CBSSports.com. Retrieved September 14, 2014. ^ Schwab, Frank (October 5, 2014). "Cardinals, already without Carson Palmer, see Drew Stanton go down too". Yahoo Sports. Retrieved October 5, 2014. ^ Patra, Kevin (November 10, 2014). "Arians: 'We can win the Super Bowl with Drew Stanton'". NFL. Retrieved November 11, 2014. ^ "Report: Drew Stanton being treated for infection". Retrieved March 14, 2016. ^ "Seattle Seahawks at Arizona Cardinals - January 3rd, 2016". Pro-Football-Reference.com. Retrieved January 21, 2018. ^ "2015 NFL Standings & Team Stats". Pro-Football-Reference.com. Retrieved January 21, 2018. ^ "2015 Arizona Cardinals Statistics & Players". Pro-Football-Reference.com. Retrieved January 21, 2018. ^ "Arizona Cardinals, Drew Stanton agree on 2-year deal". azcentral. Retrieved March 10, 2016. ^ Spotrac.com. "Drew Stanton". Spotrac.com. Retrieved March 10, 2016. ^ "Los Angeles Rams at Arizona Cardinals - October 2nd, 2016". Pro-Football-Reference.com. Retrieved January 21, 2018. ^ "Arizona Cardinals at San Francisco 49ers - October 6th, 2016". Pro-Football-Reference.com. Retrieved January 21, 2018. ^ Baum, Bob (November 2, 2017). "Cardinals believe offense is in capable hands with Stanton at QB". foxsports.com. Retrieved November 2, 2017. ^ Patra, Kevin (December 18, 2017). "Drew Stanton to start for Arizona Cardinals vs. Giants". nfl.com. Retrieved December 18, 2017. ^ "New York Giants at Arizona Cardinals - December 24th, 2017". Pro-Football-Reference.com. Retrieved January 21, 2018. ^ "Arizona Cardinals at Seattle Seahawks - December 31st, 2017". Pro-Football-Reference.com. Retrieved January 21, 2018. ^ Alper, Josh (March 25, 2018). "Drew Stanton agrees to two-year deal with Browns". ProFootballTalk.NBCSports.com. ^ www.playerpress.com (February 18, 2010). "Drew Stanton Official Website". Drewstanton.com. Archived from the original on February 21, 2012. Retrieved October 19, 2010. ^ www.ccvonline.com (April 5, 2015). "CCV Easter Service Video". ccvonline.com.